I’ve probably mentioned this in my blog about a zillion times now, but I’m super allergic to dairy products. In fact, I re-discovered just how allergic I am on Christmas Eve when I dipped a piece of lobster in a tiny bit of butter. I’ve been paying for it for the past two days. Still, I love chowder. I love its rich creaminess paired with seafood. I love it so much, I almost feel like I’d be willing to suffer the wrath of dairy for it. However, after Christmas Eve, I am reminded that really, no bite of food is worth all of that. 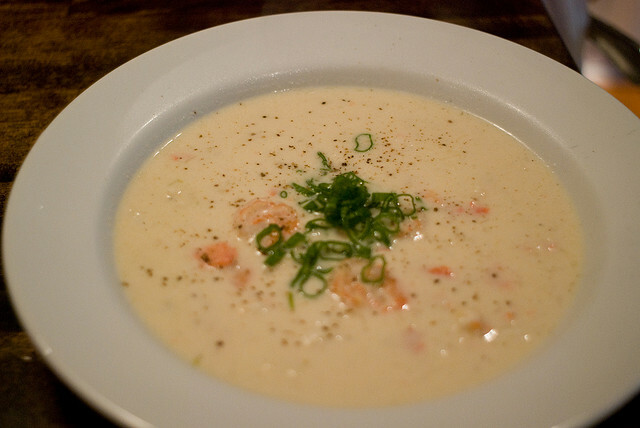 And so, I had to come up with a way to make a delicious creamy seafood chowder without dairy and without a grain-based roux to thicken it. I just made this chowder, and it’s pretty darn tasty if I do say so myself. Yesterday I prepared some homemade chicken broth, which I made from chicken feet (creepy looking! ), chicken necks, onion trimmings, rosemary, and a few other ingredients. I refrigerated it overnight, and then skimmed the fat from its surface this morning. I used the defatted stock to make this delicious shrimp chowder. The recipe yields about six to eight servings, depending on how much you eat. For me, it makes eight servings. For Jim, it’s six or fewer. Anyway – based on eight servings it has around 230 calories, 8 grams of fat, 9 net grams of carbs (unless you leave out the sweet potatoes or pick around them like I do), and 28 grams of protein. To make it lower in carbs, leave out the sweet potato. In a large soup pot, melt the coconut oil over medium-high heat until it shimmers. Add the onions and all of the peppers. Cook, stirring occasionally, until the vegetables are soft and beginning to brown, seven to ten minutes. Add the garlic and cook, stirring constantly, until it is fragrant, about 30 seconds. Add the lime juice, chicken stock, and fish sauce, stirring to scrape any browned bits off the bottom of the pot. Add the sweet potatoes and carrots and bring the soup to a boil. Reduce the heat to medium and simmer until the potatoes and carrots are tender, about 20 minutes. Add the shrimp and cook, stirring occasionally, until it is pink, 5 to 10 minutes more (five if it’s thawed, about ten if it’s frozen). In a small bowl, combine the arrowroot powder with the water and whisk to make a slurry. Pour the slurry into the soup, stirring constantly. Simmer until the soup thickens. Stir in the coconut milk, sriracha or red pepper flakes, salt, and pepper. Taste and adjust seasonings as desired. Photo used under flickr creative commons license. Some rights reserved by InSinU8.